Adventures with Dutchess….. – Journey to my heart…. The last two nights I have woken up about 330 am hearing voices in my living room. I am grateful that I also saw the glow of the TV and wondered how on earth did the TV come on during the night. As I tip toed out into the living room I quickly found the culprit, Dutch had fallen asleep with the remote. The remote that was on the coffee table when I headed to bed, but for some reason Dutch has taken to laying with it. Dutch is a collector of things. She is known to gather the last items I have worn and pull them to the couch where she lays on them. Often my couch holds any collection of the following: one of my shoes, one of my slippers, my jacket, my purse, my sleep pants, my towel and anything else that might have been obtainable by this 90 pound chocolate lab. Dutch keeps my life interesting and my heart tender. She is quick to hug me. Yes, she will gently raise up on her hind legs and lay her front paws on my shoulders, and rest her head on my shoulder. If I make the exchange with one of my co-workers, asking them to take her half way down the hall and I think I will head to a meeting, Dutch will sit down and refuse to move. When Aunt Dot and I stand in the school yard talking as I throw the ball for Dutch, she insists we take turns and will only drop the ball if the right person is holding the chuck it. She is wonderful, delightful and a lot of fun. This dog of mine is very much a part of my every day life. She goes to work with me, rides almost everywhere with me. She has playfully woven her way into my being. And I remind myself often that she is a dog. A dear dog, but still a dog. In these last weeks I had to dip into my savings to pay for her tail repair. She had an injury where it was caught in a screen door and after three vet appointments, the Vet decided the only option was to amputate half of her tail. Even in the days before, when we were trying to avoid surgery, the greatest struggle was keeping a happy dog from wagging her tail. I hope and pray I will be spared from needing to ever decide if Dutch needs high cost treatment of some kind. The costs of medical intervention for dogs is overwhelming. Today I will enjoy my stubby tailed lab whose tail may not knock everything off the coffee table anymore, but will always wag! And so I believe I found a puppy that has grown into a great companion who matches my personality. We both could benefit from walking some more, we both enjoy people, we both like to sleep in and overall we both are pretty laid back. 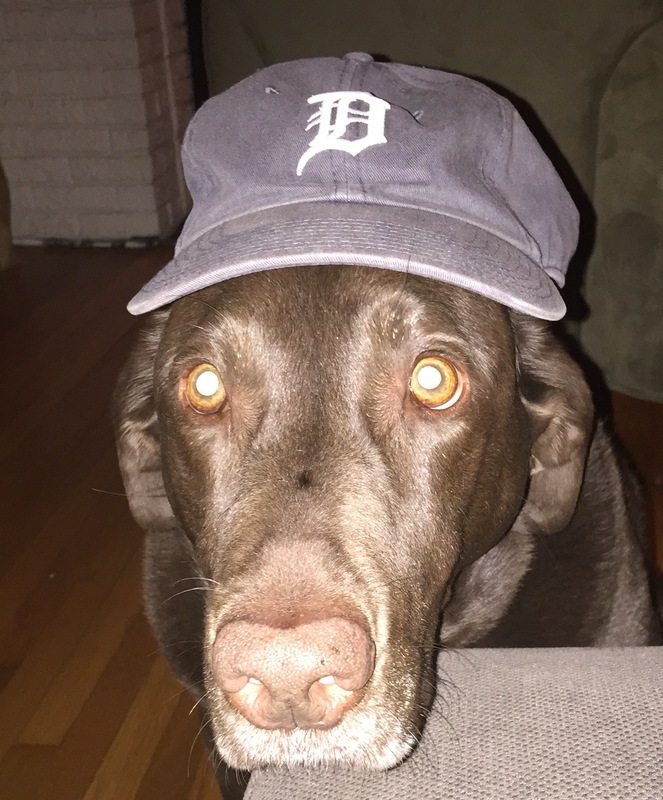 And perhaps, one fun discovery this week, is that she also loves the Tigers! Ohhhhh, Trish, I can relate…except mine is a 9 lb. dachshund!! Previous Previous post: A reason to celebrate….